According to Women's Wear Daily, MAC has teamed up with R&B queen Rihanna on multiple color collections to be released later this year. The first product of their collaboration will be a red lipstick called RiRi Woo; inspired by Rihanna's favorite MAC red, Ruby Woo. RiRi Woo will be available for purchase starting May 4, 2013, coinciding with the start of Rihanna's Diamonds Tour and will be sold both online and at pop-up shops at her concerts. 4 collections under the monikor "RiRi Hearts MAC" are to follow, launching throughout the rest of 2013. RiRi Woo will be the signature piece of the line and will be sold with all 4 collections. Following the initial launch of her lipstick, there will be a summer collection which debuts 2 additional lipsticks, a Lustre Drops shade and a powder blush duo. Her Fall collection will include 4 lipsticks, a deeply pigmented 'RiRi Woo' lipglass, 2 eyeshadow palettes and false lashes. The final collaboration collection for 2013 will be for Holiday, which will bring another 10 items to include nailpolishes, additional lipsticks and a makeup bag. RiRi Hearts MAC packaging will change with each collection, but rose gold packaging with her embossed signature has been used for her RiRi Woo lipstick, summer lipstick bullets and fall collection pieces. A pearlescent white packaging with pink accents will be used for her holiday collection. WHO ELSE IS EXCITED for RiRi [Hearts] MAC?! 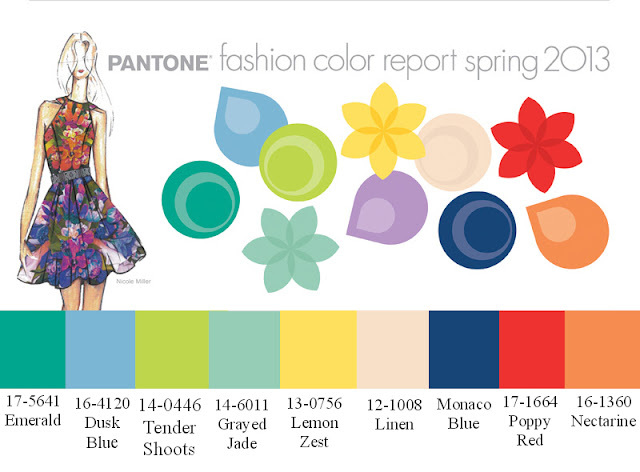 What do You think about the Spring 2013 Color Forecast for Fashion? Ulta 21 Days of Beauty is Back! returns on Sunday, March 10 2013 at all Ulta locations! For those of you who dont already know, this is a 3 week extravaganza of daily events and beauty steals. This week I noticed the very first daffodils spouting their welcome green leaves.. aah finally Spring is upon us! :) In the Mid Atlantic, this time of year is always pretty bi-polar weather wise. With temperatures back and forth between the 40s and 60s, I NEVER know what to wear! So I decided to do an Outfit of the Day (OOTD) video on my Youtube channel sharing the perfect outfit for the winter to spring transition. The perfect compromise is achieved by pairing winter pieces like tights and a cardigan, with spring pieces like lace shorts and adorable mary janes. Be sure to watch my new video for details on this cute Outfit of the Day! This month's box theme was "Glamour, Glitz & Gloss," complete with the most adorable holiday themed paper! This after-bath and shower moisturizer is a seductive blend of essential and all-natural oils formulated to leave your skin smooth, with a subtle, seductive scent. Apply this oil on wet skin to seal in moisture. Indulge in healing aromatherapy with these 100% pure Epsom bath salts. Treat yourself to a full body boost with these herb-infused accents in your bathing routine. Use weekly to dramatically reduce tension and refresh your skin. This limited edition creamy rose lipstick not only is luminous and hydrating but was developed to raise awareness for a powerful women's cause. Apply, close, then "click" with the magnetic metallic pink case that "clicks" every time you close it. A fashion forward fragrance inspired by world renowned designer Issey Miyake's iconic Pleats Please ready-to-wear line. Enjoy the effervescent, sensual, and addictive notes which embody the essence of joy, femininity, and elegance. Prepare your hair for virtually any look with this velvety soft styling primer. This concentrated serum improves manageability and amplifies control for smooth, responsive styling. These uniquely ornate nail lacquers will transform your nails into jewels. The long-wearing and toxin-free formula will keep your nails sparkling all season, and looking their glossy-best. Inspired by the runway, vintage jewelry and on-trend celebrity style, JewelMint.com offers a versatile jewelry collection each month and recommends pieces that match your personal style. As you all know, I am a BIG fan of Glossybox. Their monthly boxes consistently contain high end products. I am often impressed with product sample size, and almost always thoroughly enjoy using products I amsent. It is also the only monthly beauty subscription service that I have stuck with for longer than 6 months. Myglam/Ipsy, Birchbox and Beauty Army all ended in disappointment after 4 deliveries or less. I did however, LOVE the Zoya nail polish- it was the perfect sparkly color for the Holidays. I also enjoyed the Wella sample, and Pleats Please! perfume. My favorite item in the box was the Mark. Lipclick lipstick. I absolutely adored the magnetic click closure feature packaging! and the lipstick itself was soft, creamy and pigmented. Did you love your December GlossyBox? Intrigued ?? Sign up for GlossyBox HERE ---> GET YOUR GLOSSYBOX NOW! While I have found a few amazing concealers during my never ending journey; I was very intrigued with the new product that popped up on my television screen this week. It was prettily packaged like a lipstick, looked hydrating like a balm, and had the creamy color of a coverage capable concealer?! One look and I was SOLD! Isn't she beautiful?! I feel like I've waited years to see a product like this! While I don't have "dry" under eyes persay, I do tend to have fine lines; and thicker, drier concealers will typically crease on me. So the concept of a hydrating outer ring coupled with an inner concealing core sounds like perfection to me! 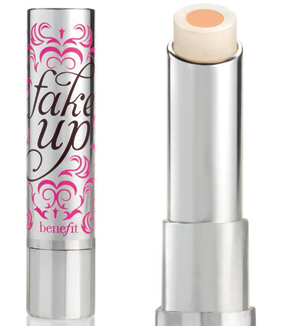 Although this product doesn't officially launch until April, you can get Fake Up now at http://www.HSN.com, it retails for $24.00 USD. 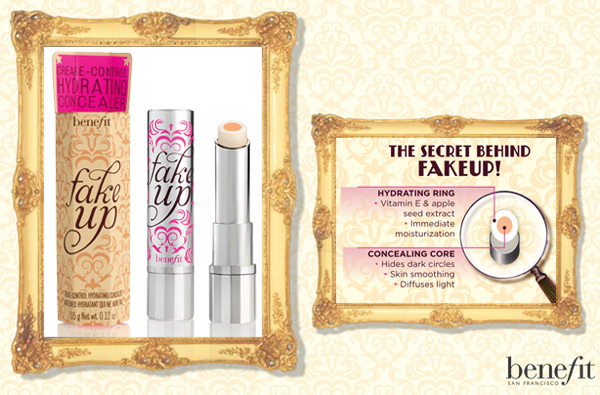 Available at http://www.benefitcosmetics.com in April 2013. WANT TO SEE which concealers are MY Favorites? Ingredients: Ricinus Communis (Castor) Seed Oil, C12-15 Alkyl Benzoate, Polyethylene, Caprylic/Capric Triglyceride, Ethylhexyl Palmitate, Cetearyl Isononanoate, Nylon-12, Silica, Phenoxyethanol, Caprylyl Glycol,Tocopheryl Acetate, Benzoic Acid, Ethylhexyl Myristate, Ethylhexyl Stearate, Hexyldecanol, Butylene Glycol, Pyrus Malus (Apple) Fruit Extract, Brassica Campestris (Rapeseed) Sterols, BHT, Tocopherol. [+/-: CI 19140 (Yellow 5, Yellow 5 Lake), CI 42090 (Blue 1 Lake), CI 77007 (Ultramarines), CI 77163 (Bismuth Oxychloride), CI 77491, CI 77492, CI 77499 (Iron Oxides), CI 77891 (Titanium Dioxide)].